For a second, let's pretend that Robbie actually cares about solving crimes and not simply about self-promotion. And now imagine the following scenario. Robbie Thomas is, for argument's sake, contacted by a family member who is desperate for hope and answers because they've lost a loved one to murder that remains unsolved. Robbie, as part of my story, meets with the family or family member and offers them comfort and support and claims that he'll use his psychic abilities to help solve the crime. Now, given the initial presumption that Robbie Thomas isn't a self-promoter but rather a selfless warrior for justice, what would Robbie Poulton do next? Contact the paper and tell his story about helping the family solve the crime? Would he willingly discuss personal information and points about a private conversation with the victim's family? If, after some time, he isn't able to solve the crime, would he advertise his involvement (as if it were successful) in books, on his website or in promotional print materials and YouTube videos? Would he continue to use the victim's name in promotional materials even after the family has specifically demanded that he cease to do so? Would he, after claiming to have fully complied with the family's request, crop an article about the crime and his supposed involvement to continue, even today, to use it for his self promotion? My suggestion is that the answer to all these questions, if Robbie Thomas had a shred of morality or ethics, would be no. As mentioned on the Sarnia Skeptic blog and on this site, Robbie has done each and every one of the things listed above. The final point, however, is one about continually and intentionally twisting the truth by omitting parts of the story. Specifically, he's gone so far as to crop a picture to make it seem like he's involved in solving a crime - a crime that is, today, unsolved. And, on top of that, it is a clipping that references the very family that has spent countless hours and untold effort trying to get Robbie Thomas to stop the abuse. Get ready for it. Here is a screen clipping from a YouTube capture (see here). The clipping refers to the Karen Caughlin murder. Yes, Robbie is that morally and ethically bankrupt. He's consistent, for sure. Consistently fails to demonstrate anything he claims as it relates to psychic abilities, crimes solved or about being selfless. His 100% failure rate does not make him a scumbag. Twisting the story to suggest that failures are successes and habitually abusing families already victimized earns him the well deserved title of scumbag. His 100% failure rate also proves he's not psychic (just like everyone else). You're not going to believe this - Robbie is a liar! 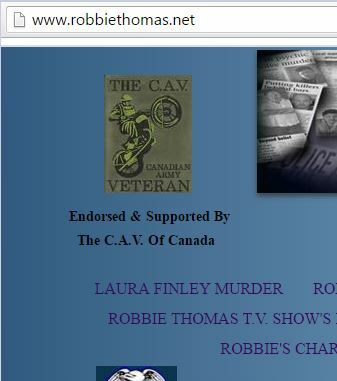 If you haven't stopped by Robbie Thomas' site recently, you might not be aware that he is "Endorsed and Supported by The C.A.V. of Canada". Don't bother going there, I'll save you the trip. In the top left corner, the very first thing you see, is his unambiguous claim of support and endorsement. Thanks for directing this observation to me. Under no circumstances have CAV ever endorsed this individual. We will be taking measured in the next couple of days to ensure the misrepresentation of our trademark logo is taken down from his website and he is fully aware of the ramifications of his actions. Thank you again for making us aware of this issue. That's not the first time Robbie has lied and, if I'm psychic (nobody is), I'm betting it won't be the last. To this day, he still has "endorsements" on his site that are attributed to people who have publicly stated that they are lies, taken out of context or are blatant misrepresentations. I must be psychic - I saw this one coming. Surprise! The endorsement has disappeared. I wonder if the Crime Stoppers endorsement goes next? Robbie, thank you for making this so much fun! This next screen capture has soooo much to work with. We'll see if Robbie takes down the Crime Stoppers "claim" before I'm even back from vacation. Robbie - which search organizations endorse you as a psychic? What law enforcement claims you're a psychic and supports you? Oh, and Crime Stoppers? The letter they sent me is priceless - and doesn't support Robbie's claim. Robbie Thomas - still not psychic and still sporting a 100% failure rate when it comes to solving crimes with his (non-existent) psychic abilities. Congratulations! Unfortunately, the site no longer has the old stoprobbie.com domain. Currently stoprobbiethomas.blogspot.ca and robbiethomas.sarnia.com point to the site. It has been quite some time since the site has been updated but I think the only thing that has really changed is the number of years that Robbie Thomas has been a lying piece of crap. Five years later and Robbie Thomas has still not solved a single crime using his self-proclaimed psychic abilities. Just like all other people, Robbie Thomas is not psychic. To make things simpler, has never solved a crime using psychic abilities. No matter what name you insert, the statement is true. Just as " is not psychic" is universally applicable. Robbie Thomas (Robbie Poulton) is still claiming that he is a psychic who has used those abilities to solve crimes and he continues to post testimonials from people who (he claims) support that he's "the real deal". Yet, Robbie Thomas does not have a list of "Crimes I've Solved" on his site because he has never solved a crime using his non-existent psychic abilities. Throughout the years, Robbie has talked about a number of crimes that he has supposedly been involved in solving but, time and again, when we follow up with investigators or family members, they, almost without exception, say "he's lying". Why do they say that? Aside from that being the truth? Let's take a quick look. Take a browse through this site and you can see, in detail, the disgraceful actions and claims of Robbie Thomas and the like. Robbie (Poulton) Thomas is a claimed "Psychic Investigator" in Sarnia, Ontario. With a supposed 18+ years in the pseudo-psychic business, Robbie has re-victimized a number of people - we have created this site to bring an end to his abuse. Robbie claims involvement in a number of high profile cases ranging from Natalee Holloway and Caylee Anthony to local cases from Tori Stafford to Karen Caughlin. To this date a number of cases that Robbie claims to be (but is not) involved in remain unsolved. His continued self-promotion using these cases is unhelpful, distasteful and inhumane. This site is designed with the intent of changing Robbie's ways and, failing that, to alert people to the danger and risks of Robbie Thomas. 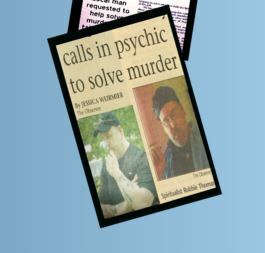 Psychics have never been credited with solving a missing persons or murder case using any claimed psychic powers. It is our opinion that Robbie Thomas, then, is nothing more than a liar and cheat.